Last Thursday night we had a pre-Thanksgiving dinner at our house called, among other things, “Potato and Pie Thanksgiving”. This is my husband’s dream menu for Thanksgiving, and I have to admit that it sounded pretty great to me, too. We had some friends over and each person was charged with bringing a potato-based dish and/or a pie. We also planned a prize for the most creative and delicious item. It was so much fun! The dish that won was a potato dish that took the idea of scalloped potatoes one step further with a creamy sauce, kielbasa, and extra cheese. So good! Because this is a group of friends that we get together with to watch MacGyver and other ’80’s TV shows, the prize was a Swiss Army Knife, an important tool that our hero, MacGyver, is never without. Since we were the hosts, we didn’t compete, but one of our potato dishes was quite popular all the same. I’d like to share it with you. It’s a recipe that is common at my husband’s family gatherings and is everything people like in a good holiday dish: fast, easy, and deliciously unhealthy. If you need a potato dish for your Thanksgiving feast, you might try out “Hobo Potatoes”. Preheat your oven to 375 degrees Fahrenheit. Spray a 9″x13″ pan with non-stick cooking spray. Mix all ingredients except the corn flakes and reserved butter together right in the pan. Mix corn flakes and the reserved butter together and spread on top of the mixture you just made. Bake the dish, uncovered, for one hour. Serve warm. Today I want to introduce you to a fun and funky restaurant in Portsmouth, NH: The Friendly Toast. I can’t remember how we discovered The Friendly Toast, whether through a recommendation or by stumbling upon it, but it has become a favorite. We’ve also visited the Cambridge, MA branch, but the Portsmouth incarnation is the one we’ve come to love the most. The food choices are really creative, as are the drink options. Today, I ordered Green Eggs and Ham, which was a slice of anadama bread with ham and two poached eggs on top, covered with a creamy herb sauce and served with home fries. I’m also always tempted by the coconut pancakes which include cashews, shredded coconut, chocolate chips, and a coconut sauce on top. We’ve even incorporated meals we’ve had there into our own home rotation (see the end of the post for the recipe we came up with). The food is good, but that’s not the only thing we love about The Friendly Toast. It has a really eclectic, kitschy, vintage feel to it. All those crazy signs and oddments you find at antique stores, flea markets, and garage sales? I think most of them have ended up here. Looking for a doll flying a helicopter? Too late–The Friendly Toast got to it first! The Cambridge branch has the same sort of décor, but it feels a bit more planned out. You can never feel bored here, because there is so much to look at. I also find the people that you see at the restaurant very interesting. It’s an amazing conglomeration of young families, older families, tattooed vintage-lovers, hipsters, baby boomers, and everything in between. There aren’t many places that appeal to such a wide array of people. If you ever get the chance to go, may I also recommend buying a loaf of bread? We nearly always come home with a loaf of their Cayenne Cheddar Bread (but their Anadama is pretty great, too, and it’s a New England favorite). I’ll leave you with our version of a special we once tried at the restaurant: New England Poutine. Of course, it’s not quite as good as the original, but it’s close enough to be incorporated as one of our favorites. *If buying frozen sweet potato and potato products, see if you can find packages with similar cook times and temperatures. Cook your sweet potato and regular potato fries according to package instructions or at 450 degrees for 20-25 minutes or until done, stirring once. Meanwhile, warm your corned beef hash over medium heat in a frying pan on the stove, stirring occasionally. At this point, prep your Hollandaise as much as you are able to, leaving the final steps undone. If that feels like too much, do the Hollandaise after step 6. When your potatoes are cooked, plate them according to how much you think each person will eat, putting just a little less than you think they will want on each plate (there is more to add to this plate, so trust me on this). Next, cover the potatoes with corned beef hash, again just a little less than you might think. Top this with some chunks of cheese. Now finish up your hollandaise and pour some over your potatoes and hash. Finally, garnish with scallions and serve with the toast of your choice! Hope you enjoy this recipe. Now even if you can’t get to the Friendly Toast, you can pretend you’re are eating there. 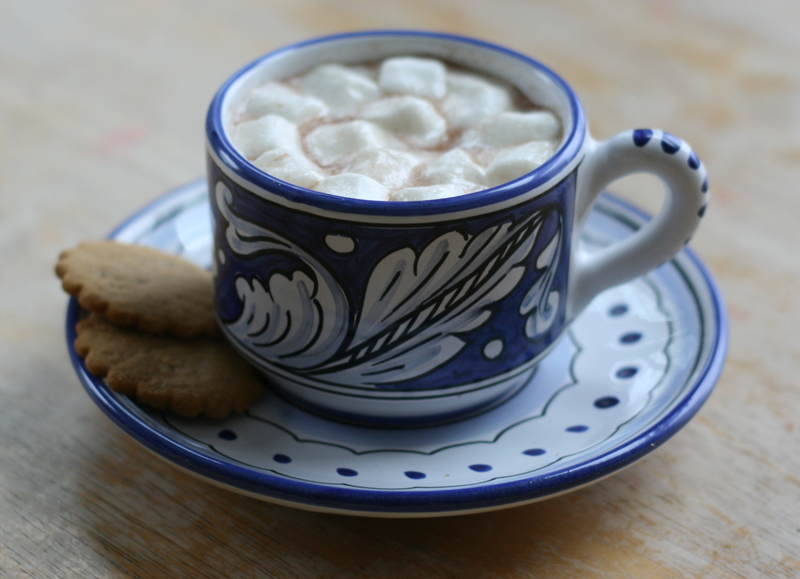 Hot chocolate has been a winter staple in our house as far back as I can remember. My Mom had a recipe she got from a cookbook called House Specialties. (I’m guessing this is the author’s web page, but I’m not certain. Looks like the book may be out of print.) Over the years, she tweaked it until it became her own. Not only did that hot chocolate recipe warm my winters at home, it carried my roommate and me through college and became famous among my friends. When I got married, my Mom passed the recipe along to me, and I did my own tweaking until it became my recipe. Our kids and frequent guests have come to love it. I thought I’d share it with you so you can make it your own, too. Note that these are not hard and fast measurements. I’ve adjusted them to the amounts I find at the grocery store, so feel free to do the same. Mix all ingredients in a huge bowl. Store in a large container (I use a 23 c. (about 5 1/2 L) plastic container, but have also used zip top plastic bags and large plastic pretzel containers. Mix 3-4 heaping tablespoons in 6-8 ounces of hot water. If you want to try some great add-ins, I recommend any of these, or a combination: half and half, cream, flavored creamer, flavored syrup (I like peppermint. ), candy canes or peppermints, marshmallows. This makes about 87 ounces (5 1/2 pounds). A heaping tablespoon of this mix is about 1/2 ounce. This is a great recipe to change up according to your own tastes. If you try it and come up with some favorite new recipes, I’d love to hear about them!